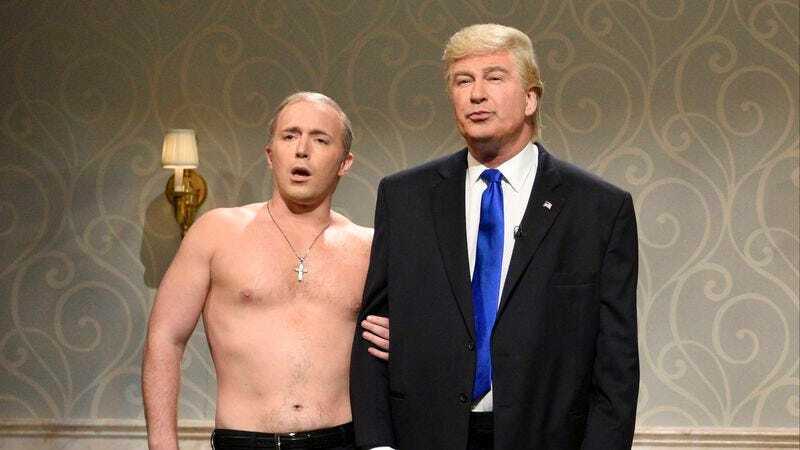 In the waning days of the presidential campaign, Saturday Night Live enlisted Alec Baldwin to play Donald Trump, seemingly figuring, “Eh, this guy’s not going to make it, we don’t need a cast member to do this impression.” Well, obviously the show was wrong, as so many of us were. The first post-election show went for a solemn Hillary Clinton sketch to acknowledge the results, but Baldwin will be back playing Trump this weekend, Variety reports. Former cast member Kristen Wiig is hosting the episode. Baldwin explained that he’ll return “every now and then,” but also reminded everyone that he’s not a loser who just happens to be free every Saturday night. “What’s interesting is when people said to me, ‘You didn’t do it after the election,’” he told Variety. “I’m not available every Saturday night of my life, you know what I mean? We had other things to do.” What is he, a farmer? Still, SNL might want to look into having someone do Trump in-house. After all, the man is the president-elect, no matter how hard anyone may try to deny it.